Mashhad is the holiest city in Iran. 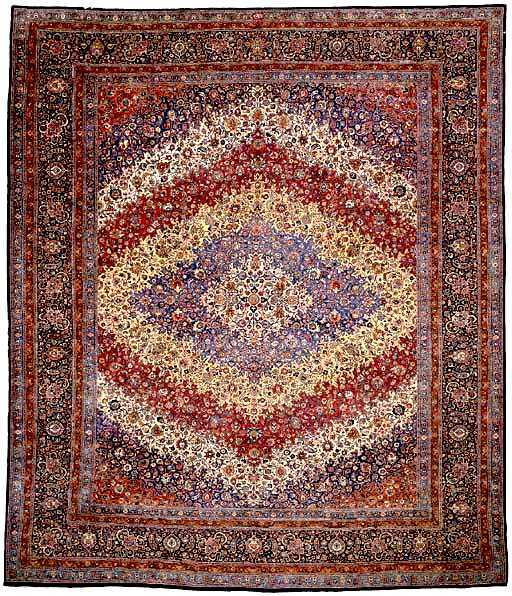 It is also one of the oldest centers of carpet weaving. 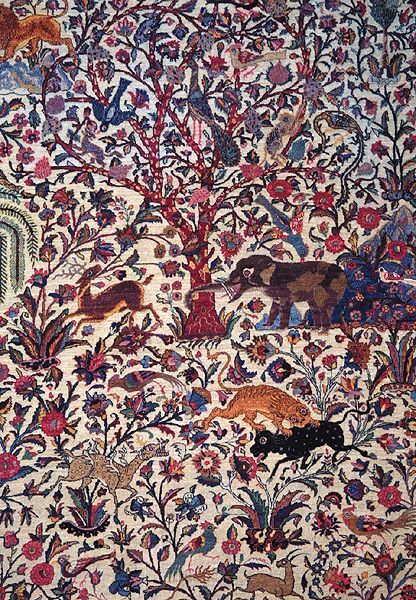 The Perez Topkapi prayer rug was woven between 1550 and 1556 most likely in Mashhad. 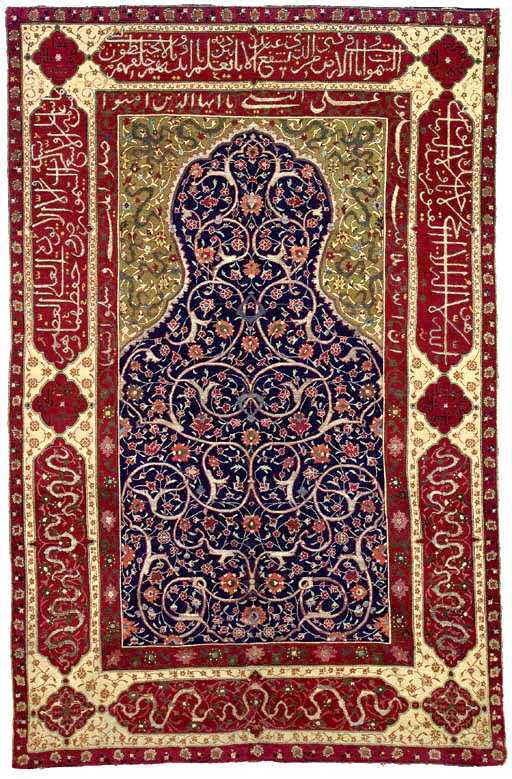 The oldest Mashhad rugs that I know of are a group of prayer rugs that were given by Shah Tahmasp to Suleyman the Magnificent in 1556. 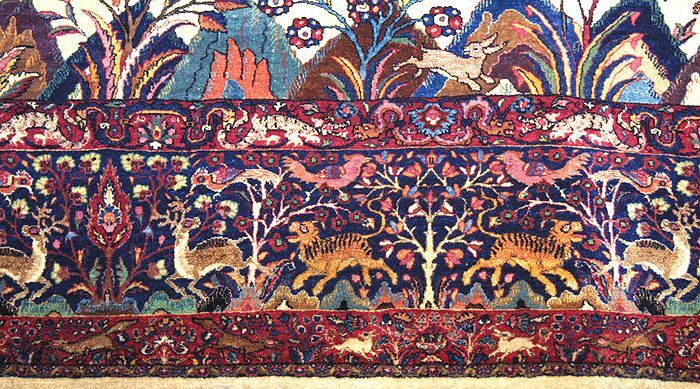 The rugs were made in three grades by the workshop of Sultan Ibrahim Mirza son of Sam Mirza and nephew of Shah Tahmasp. 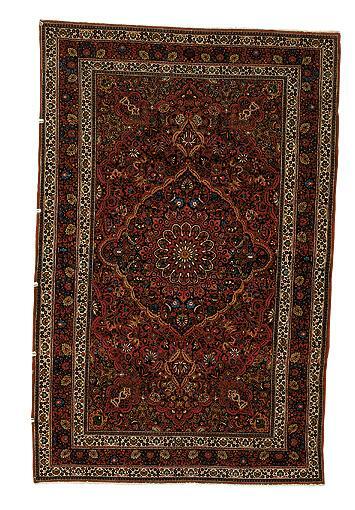 The top grade or Imperial grade was the finest and one of those rugs was in London two years ago and I believe is now in the hands of art collector Sheikh Saud Al-Thani of Qatar. Several of the second and third grade examples are still in the Topkapi Museum. 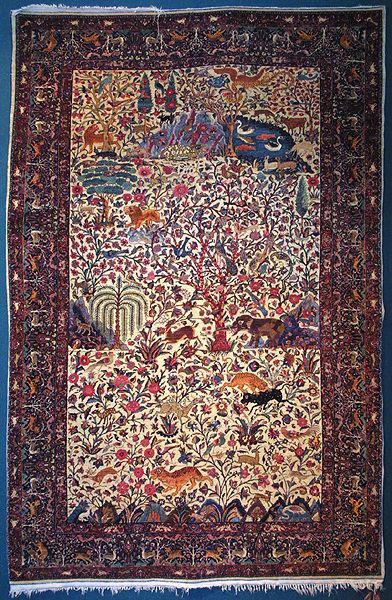 In the 19th and 20th centuries Mashhad carpets were popular items of commerce and were made for domestic use as well as export. At one point the wool was heavily scoured so that it would take dyes better. 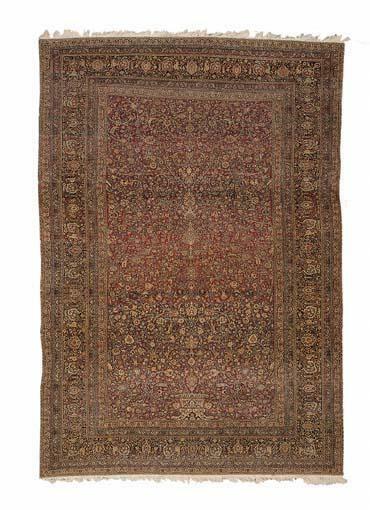 An unfortunate side affect was that the scouring took all the lanolin out and the carpets did not last as long as other Persian carpets. 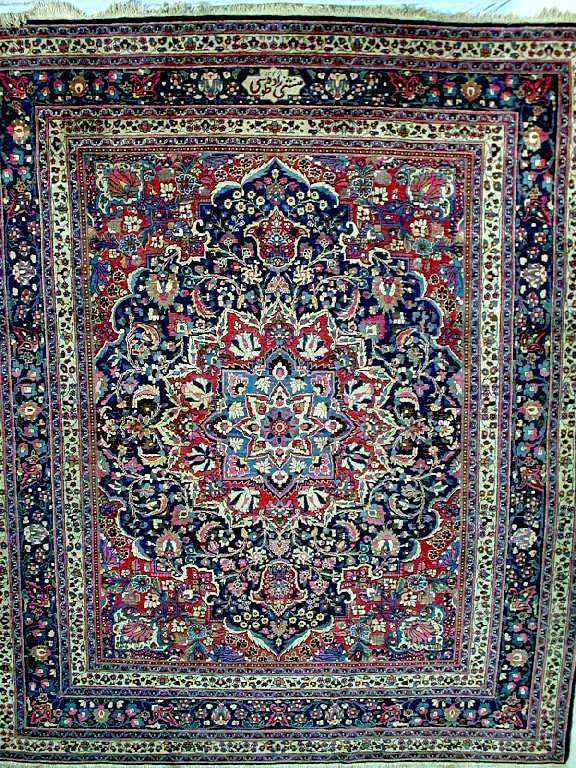 This created a negative image of Mashhad carpets in some peoples minds. 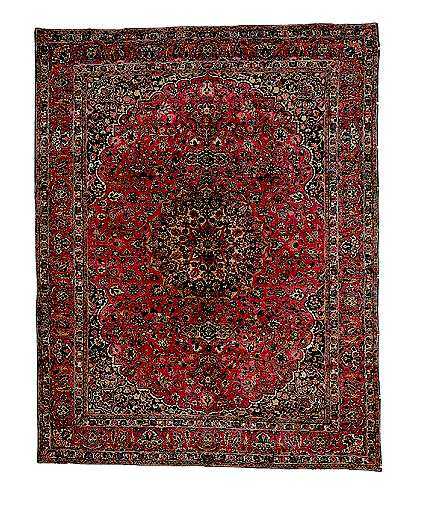 This was exploited by European and American dealers to push rugs made by European firms since the Europeans never made the inroads into Khorasan like they did in other areas this was a popular story. 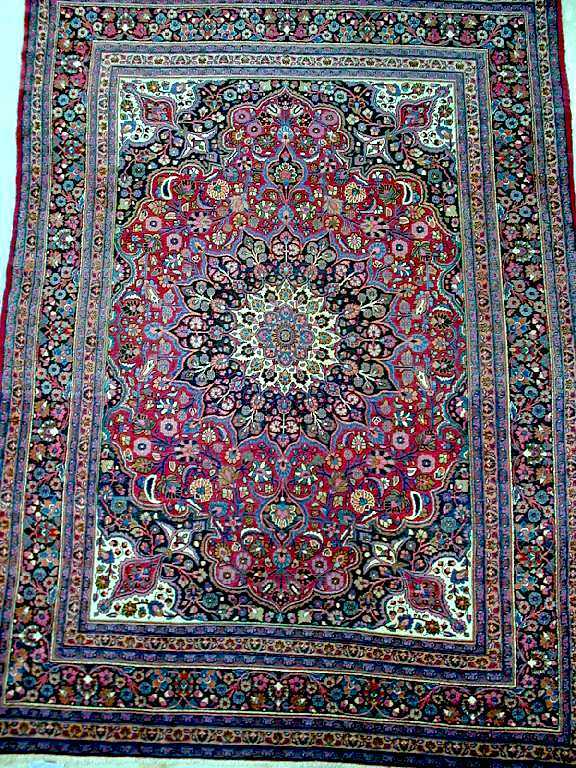 The wear problems are no longer a factor and it is very rare to see a Mashhad carpet with that problem today. The problem is old enough that the ones that are prone to wear are already worn. 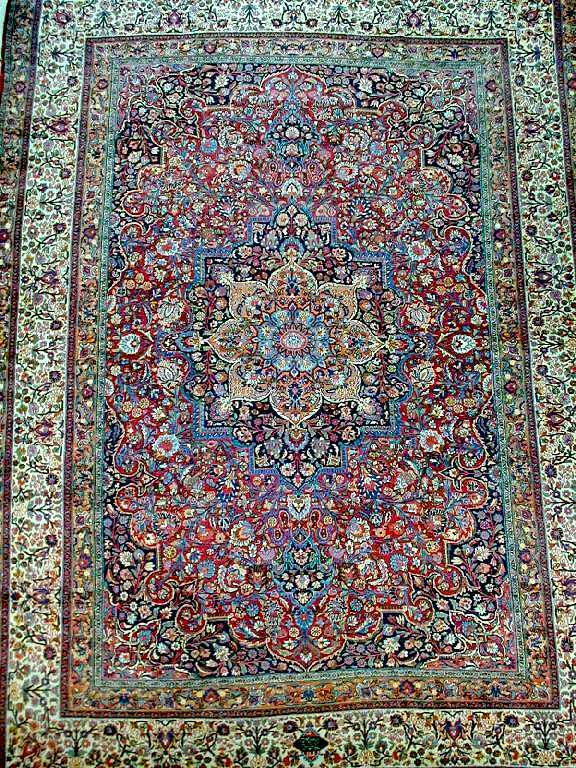 The best rugs in the world today are from Iran. 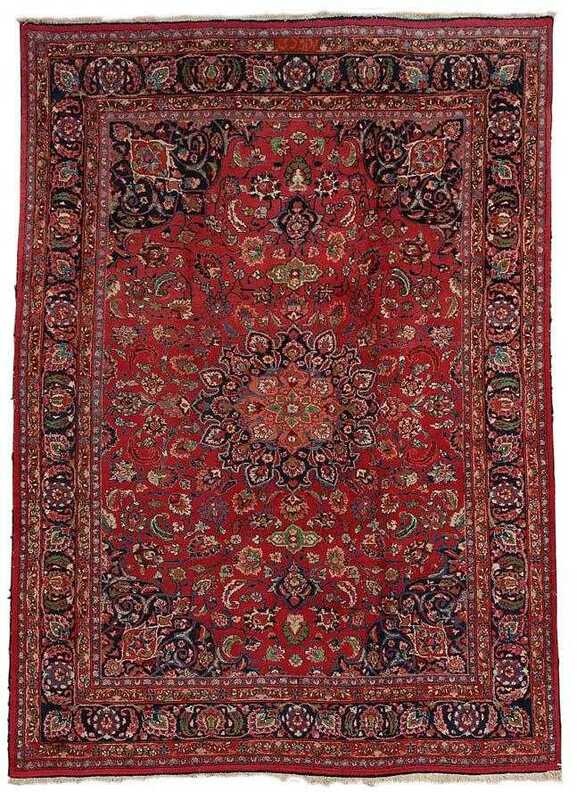 If we are to make a short list of the best rugs from Iran we must include Saber of Mashad. Master Ahmad Bazmi now runs the Saber Workshop after the death of Master Abas Ali Saber by agreement with his heirs. 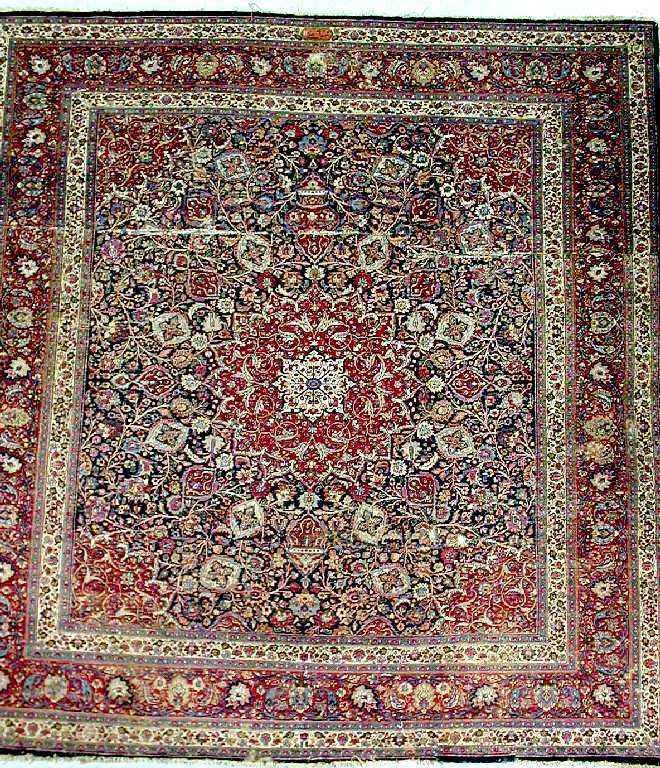 Amoghli Mashhad Persian carpet 20th C.
10ft. 5in. x 10ft.1in. 3.17m. x 3.07m. Reduced, some wear, patch lower edge. 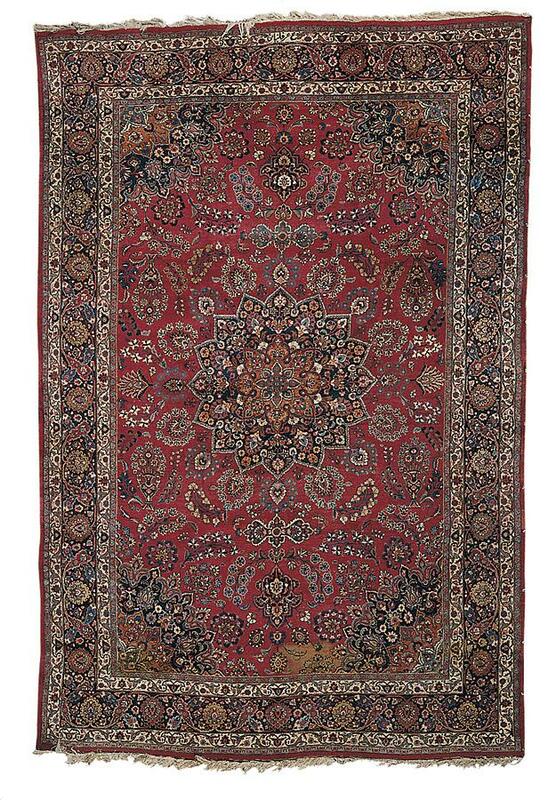 Amoghli was the greatest master weaver of the 20th c. This is an early version of the 'Ardabil' design used on the work commissioned by Shah Reza in the 1930s. 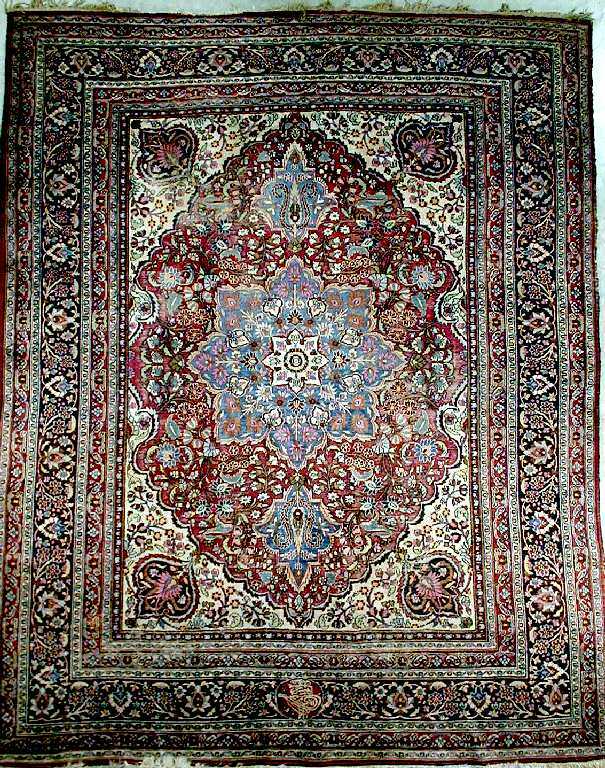 Modern Amou Ughli Mashhad Persian carpet 20th C.
Circa: 1900s. Length: 380 cm. Width: 190 cm. Other Information: Signed Amou Ughli. 335 by 228cm., 11ft. by 7ft. 6in. Northeast Persia. Signed Amoghli. About 1920. 10ft. 5in. x 10ft.1in. 3.17m. x 3.07m. Reduced, some wear, patch lower edge. 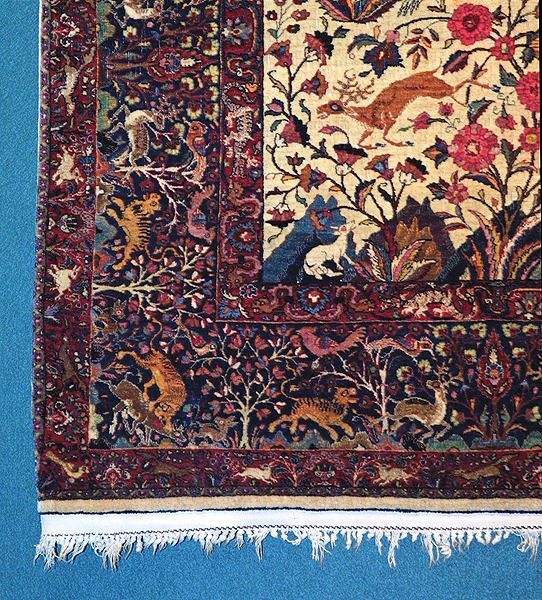 This is an early version of the 'Ardabil' design used on the work commissioned by Shah Reza in the 1930s. 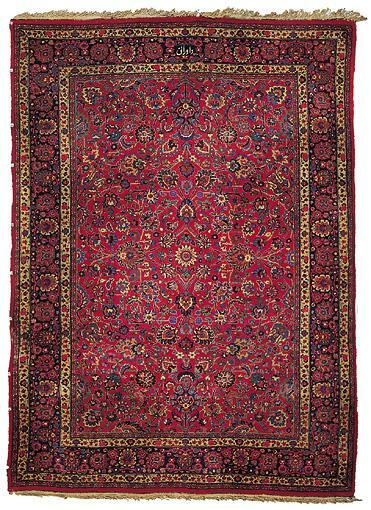 Hajji Malek Mashhad Rug/Carpet early 20th C.
Mashad carpet, Khorasan northeast Persia early 20th century, 12ft. 2in. x 8ft.1in. 3.71m. x 2.46m. 13ft.1in. x 9ft.4in. 3.99m. x 2.85m. 227 by 147cm., 7ft. 5in. by 4ft. 10in. 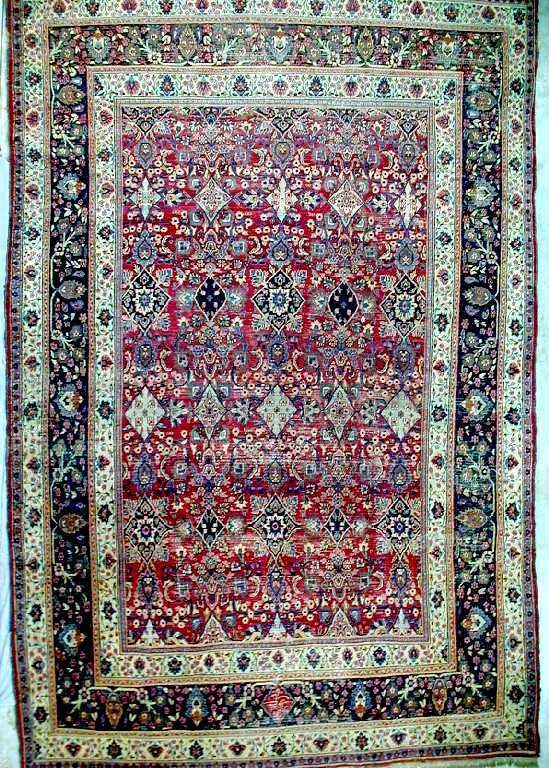 Mashhad rug early 20th C.
359 by 263cm., 11ft. 9in. by 8ft. 8in. Signature cartouche at one end. 358 by 275cm., 11ft. 9in. by 9ft. 521 by 342cm., 17ft. 1in. by 11ft. 3in. Signed and numbered '322/13.' About 1920-30. 14ft.5in. x 10ft.7in. 4.40m. x 3.23m. Slight wear in places. 490 by 358cm., 16ft. 1in. by 11ft. 9in. 454 by 308cm., 14ft. 11in. by 10ft. 1in. 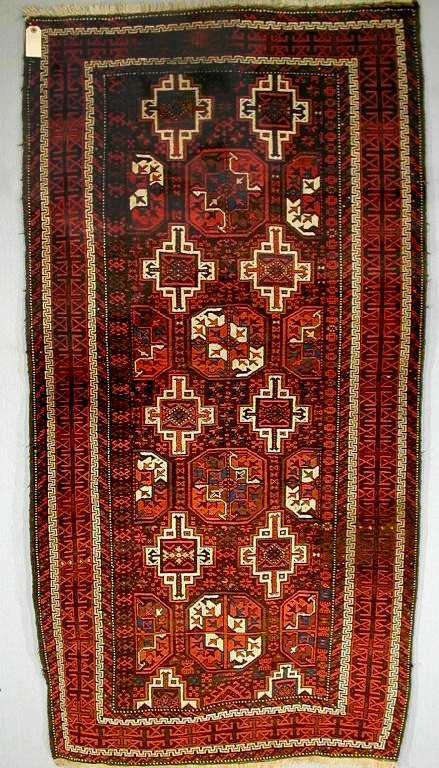 Signed 'Monshi Zadeh Fotussi' and dated 1348AH (1929-30CE). 12ft.3in. x 10ft.2in. 3. 73m. x 3.10m. Size: 190cm x 125cm / 6'3" x 4'1"
10ft.6in. x 8ft.5in. 3.20m. x 2.56m. Slight overall wear, heavier in small areas. Note the presence of a Tughra in the top border, the elaborate form of monogram used by succeeding Turkish sultans. 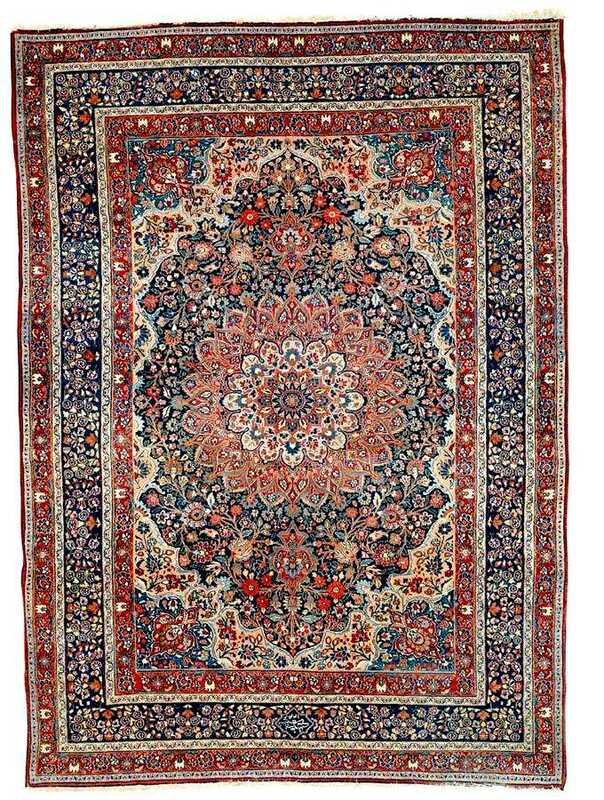 This is a truly incredible rug. 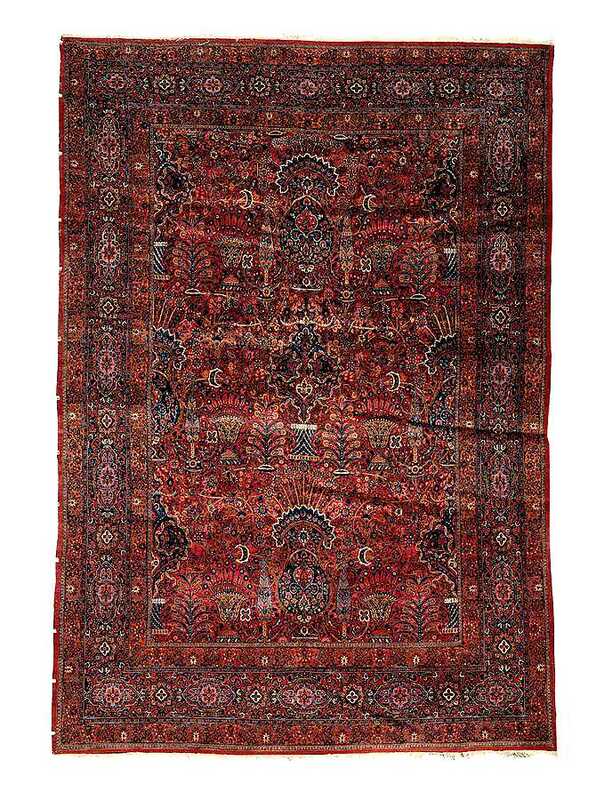 It is one of the greatest rugs of the Safavid period. 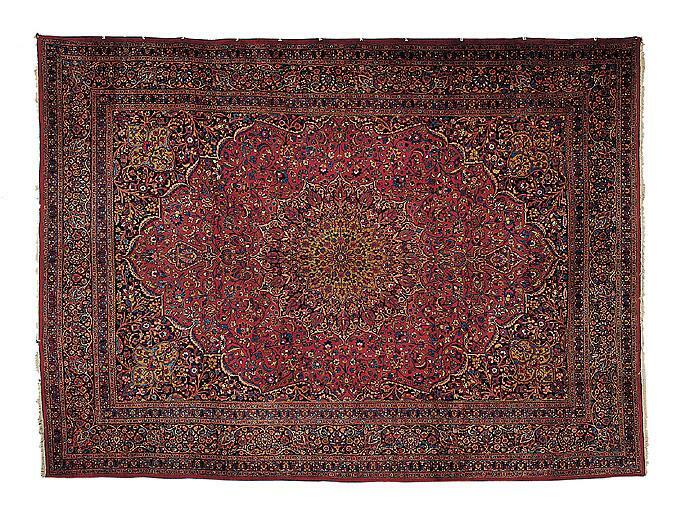 This rug belongs to a small related group of rugs that were in the Imperial Ottoman treasury and are known today as Topkapi prayer rugs. With the similarities within the group, it is reasonable to assume that the group entered the treasury together. 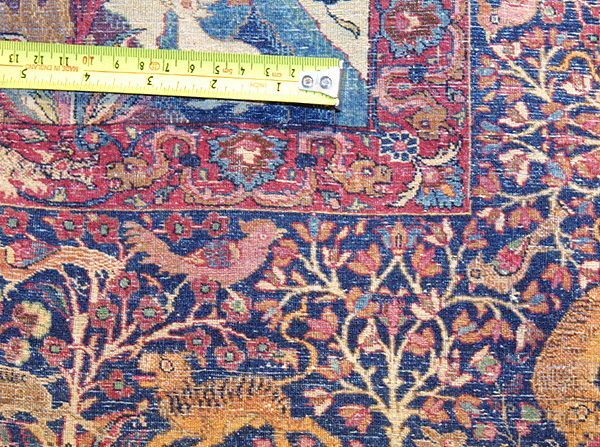 Further more it is both reasonable and proper to conclude that these rugs were made in the same time and place. A few years difference in age is possible but even 15 or 20 years is not credible. 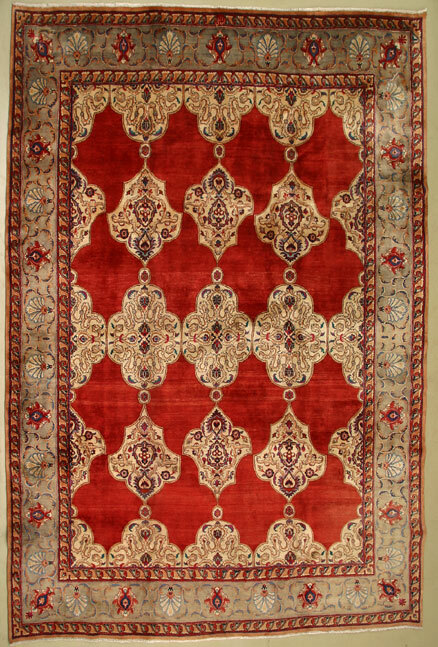 Based on research, it is known that these rugs as a group use dyes not available in Turkey but in common usage in Iran. 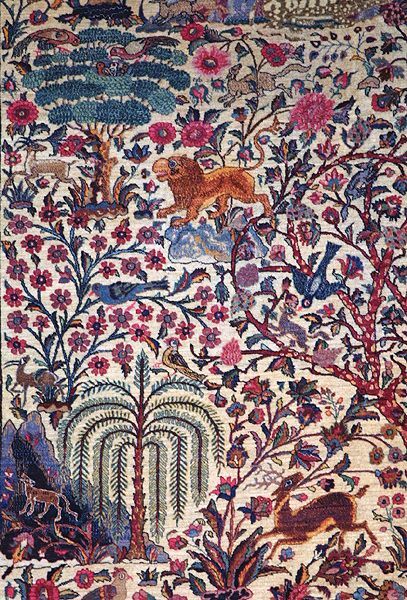 Central Persia, 16th/17th century. Minor localized wear, corroded metal-thread, a few small repairs and reweaves. 5ft.5in. x 3ft.5in. (165cm. x 104cm.) The inscriptions are from the Qur'an. Mashad area, Khorasan, northeast Persia about 1900-20. 6ft. x 3ft. 1.83m. x 0.91m. Two areas of staining. 22cm. diam. 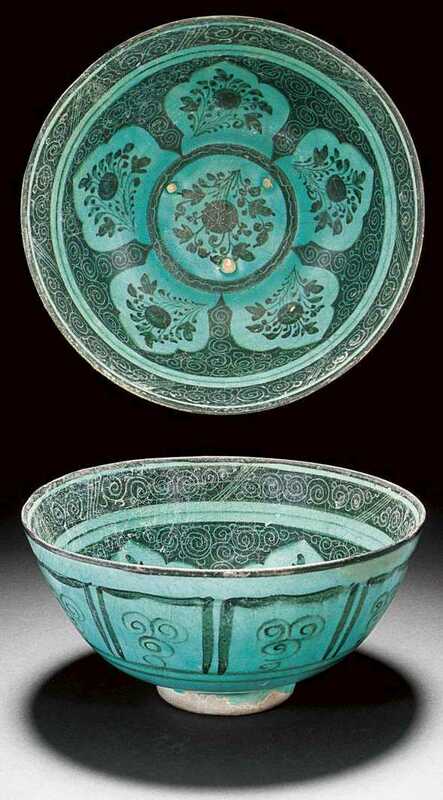 Of hemispherical form on a short foot, decorated in under glaze black under a transparent turquoise glaze with a central medallion enclosing a floral spray and five further floral sprays in ogee panels in the cavetto reserved on a black ground incised with scrolls, the back with stiff petal panels filled with scrolls.